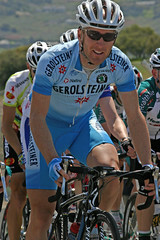 Levi Leipheimer will return to the Discovery Channel team after stints with Rabobank and Gerolsteiner. Leipheimer's upside: Multiple Tour Top 10s (13th this year), Dauphiné winner this year, American, gorgeous former pro rider wife. Leipheimer's downside: He's 33 and looks (facially) more like Lance Armstrong every time I look at him. Also signed were Sergio Paulinho, implicated but apparently cleared in the Operación Puerto investigation, and Latvia's Tomas Vaitkus. Bruyneel says the team expects to sign 2 or 3 more riders. Update 7/25 a.m. ThePaceline has removed the link, for now (update to the update: It's back), but I'm assuming it's a legitimate release made public too soon, and the signing will be announced later this morning. Meantime, there's a story on Discovery Channel's Tour, and its search for a new leader, at the Houston Chronicle website. VeloNews confirms the transfer by way of Specialized, Leipheimer's bike sponsor. Leipheimer will next defend his title at the Tour of Germany, with the transfer effective January 1. Interesting that the link has been taken down already! As I said below, I think this works. Disco doesn't want someone just reaching their prime, because Tommy D. is growing up fast and well, and maybe someday Popo Puppy will too, you never know. Levi impressed at the Dauphine, showed he could take charge. Yes, you have to bring it when it counts, but he clearly had some kind of illness at the Tour. Of course, Floyd had a nasty chest cold that we never heard about, but I digress. Levi is not one for the ages, but he's a podium contender. And let's face it, Disco could use one of those about now. Am I missing something with Savoldelli? Surely he's got the class and the know-how - he just didn't have the form this year. That's funny that they removed it, after you let the cat out of the bag! Poor Hincapie. It looks like the Disco train is passing him by and he's going back to domestique status. Frankly, I'm surprised that Levi is the "big signing". Julie may be right that what they need now is a bridge, and perhaps in particular an American one, to get to Danielson. They could certainly do worse than Levi, but I also think Levi's days as a legitimate TdF contender are past. His ITT skills/capacities have eroded, and he's inconsistent in the mountains. He's still good enough to log a top 10 finish, but I think the podium is out of reach for him. Well, I guess the news kills any suspense involving Landis and Discovery eh? Or Ullrich and Discovery? Hehe, these were longshots at best I guess. But I have to think that Discovery (Bruyneel and Armstrong, esp) learned their lesson at this year's TDF. Going in with a bunch of contenders without a clear leader -- while it's a fun strategy/"idea" to play around with -- does not work. Both Floyd and Levi (ironically) have said something similar in the past. It helps when the team is fully committed to a single leader leading up to a grand tour. That said, I don't see Levi as being the best fit for Discovery's TDF "bridge" leader, especially at this juncture in his career. Kurzleg's comments ring true to me. Savoldelli: I had heard that he was riding more for himself this Tour, looking to sign with a new (possibly Italian?) team. That certainly doesn't help a team trying to win a TDF. FYI that's the Houston Chronicle, not San Francisco. Thanks, Dave, corrected -- that's what I get for posting at 5 a.m. I'm hooked on the Tour(my 3rd year) The tour of California came down my street! how cool is that 2cnd street downtown San Jose-what I want to know is ? why is'nt Egoi Martinez the man 4 disco? Read his bio.He's battled Lance in the mountains of Mont Saint-Claire in 2004.Came in 2cnd to Valverde in time trials in 2005's GP Miguel Indurian.We saw what he did in TDF too bad he wrecked! I tought he was gonna be my next Hero from team disco?